Crystal Palace became the fifth side from the Third Division to reach an FA Cup semi-final. Managed by the unique figure of Malcolm Allison they played five of the seven matches up to the semi away from home and won victories at Leeds, Chelsea and Sunderland. 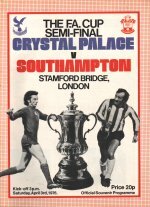 However they lost 2-0 to Southampton in the semi at Stamford Bridge with the south coast side going on to gain a memorable victory over Manchester United in the final.